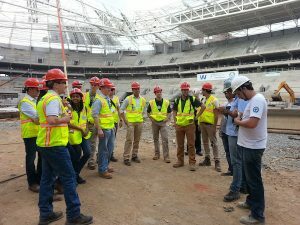 After enjoying our lunch at a near by shopping center, our group headed over to the Allianz Parque, the future home stadium of Sociedade Esportiva Palmeiras, one of the three major football teams in Sao Paulo, Brazil. The arena is being constructed where the old Palmeiras’ stadium was located, and the entire project is entirely funded by WTorre Properties, one of the major real estate developers in Brazil. The total cost of the project is approximately 600 million Reais, which is about 250 million US dollars; as the sole funder of the project, WTorre Properties is allowed to collect ticket revenue in the next 30 years. The arena is designed to seat 45,000 people for regular football matches, 12,000 people for theater performances, and up to 55,000 people for concerts. 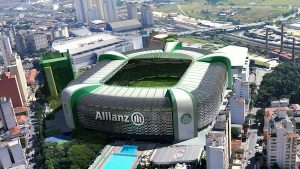 There are also three additional buildings around the Allianz Parque, including an eight-story parking lot with 2160 parking spots, a ten-story multi-purpose building, and a four-story athletics center. 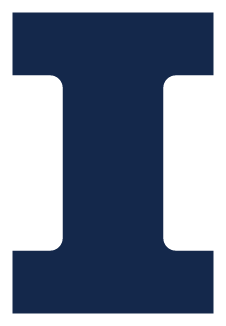 You can see the total scope of the project from the picture below. The project began in December 2011 and will complete around May 2014, a month before the season opening game on June 8th. However, a large amount of work is still required to be done; as a result, WTorre is planning on increasing the amount workers on site from the current 800 to 1600 within the next couple weeks. One of the interesting things about this project is that WTorre Properties did not completely demolish the old Palmeiras’ stadium. Due to conflict with local authorities in Sao Paulo, WTorre was only able to acquire a renovation permit; as a result, 30% of the original stadium needed to be preserved. However, since the Allianz Parque is much larger compared to the old stadium, most of the original stadium is actually covered under the new stadium seats. As the largest cement producer in the world, concrete is the primary material when constructing a building in Brazil. As a result, the majority part of the Allianz Parque is constructed in precast concrete. According to one of the project engineers, there are over 200 different prefabricate models that were used for the stadium. A standard prefabricated row seat weights about 1 ton and a prefabricate support weights about 5 tons. To complete the project in a timely manner, WTorre used 12 cranes simultaneously to place these pieces. During our visit, construction workers are completing the support for the cladding (the out side cover) of the stadium and placing prefabricated concrete row seat and the steel frame roof in the stadium. The stadium will be the first sporting venue in Brazil to have heat and sound proof systems that will efficiently decrease the negative impacts to the surrounding neighborhood when hosting larger events. It will also have nearly 200 skyboxes on the 3rd and the 4th level of the stadium (there are 5 levels total). Each of these boxes cost around 400,000 Reais to 1,000,000 Reais per season. WTorre is also one of the companies responsible for introducing LEED certification system by the United States Green Building Council to Brazil; as a result, the Allianz Parque was able to to achieve a LEED certification, and planning on receiving a silver certification when the project is completed. According to the project engineer, the LEED certification system has become increasing popular on larger projects in Brazil. 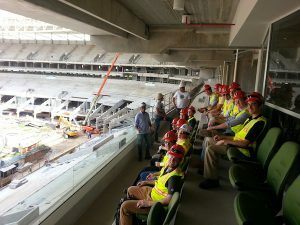 The visit was very exciting overall, GLCM was able to tour a private skybox in a sporting venue and learn about different technics and initiatives Brazilian construction companies have been implementing for higher quality results.